Please read prep note above before you begin. Step 2: Add the buttermilk and the eggs to the dry mix. Whisk until well blended, but do not over mix. Pour in the cooled, melted butter. Mix until thoroughly combined. Step 3: Remove the scorching hot pan from the preheated oven and place on the stove top or other safe surface. Pour the batter into the pan. You will hear a delightful sizzle sound! Step 4: Bake for about 20 minutes. A toothpick will come out clean when inserted in the middle. Alternatively, the bread will spring back to the touch. Step 5: Remove from the oven and set the pan on a cooling rack. Allow to cool for about 15 minutes before cutting. To store: place in an airtight container for up to two days or freeze for up to a month. 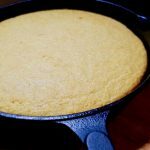 Pan Alternatives: If you do not have a cast iron pan, no problem! Use a 9×9″ baking pan that you are able to preheat in the oven. The nutrition information provided below is for the recipe as written using organic brown sugar. Bread may be sliced into twelve wedges.